Last week the new Dietary Guidelines for Americans were presented and I, along with many others presented my comments and opinion on these new guidelines. Among many of the comments going around was the fact that once again politics influenced some of the recommendations. They also recommended a Mediterranean style eating pattern that was not exactly Mediterranean. 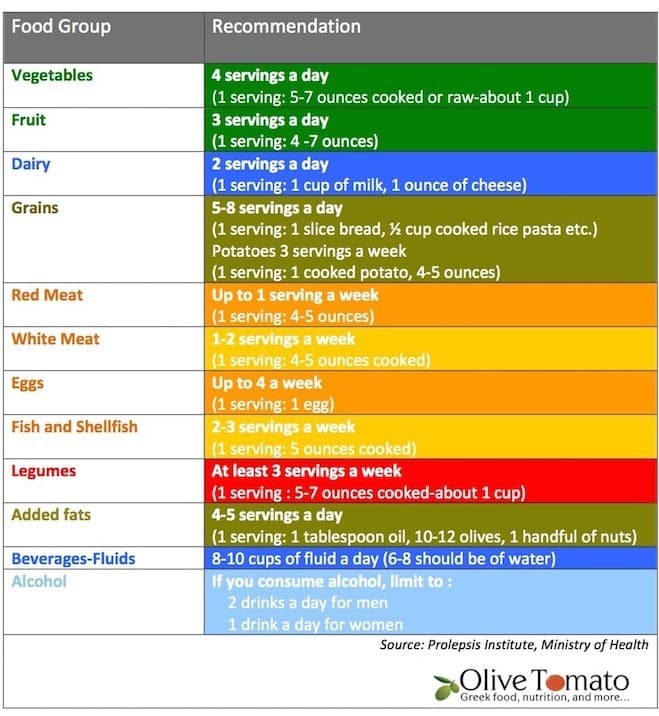 Now about a year and a half ago, Greece also published their own updated dietary guidelines, and I saw it fit to publish them here. I took the initiative of translating them in English and I am presenting them here on olivetomato.com. The guidelines (as the previous ones as well) basically follow an almost true Mediterranean diet, the Greek diet. With the exception of some details, such as only 2 servings of low fat dairy (instead of 3) or a slightly higher consumption of white meat (it recommends 1-2 serving of white meat a week-I would limit to 1 serving white meat) a week, these recommendations are spot on! And notice how none of the recommendations seem to be influenced by “politics” either. Now one may say “yes but the U.S. is not Greece”, but really when you look at these guidelines, they are not “exotic” or difficult, this eating pattern can be followed by anyone, anywhere. Sadly, I have to say that many Greeks do not follow these guidelines, but what is more concerning is that even colleagues of mine who have their own nutrition practices do not follow these guidelines. Unfortunately, you will still see in many dietitian offices and even in schools as well as presentations here in Greece, the U.S. plate or even the old U.S. Pyramid being used. I have no idea why. It is such a shame that here in Greece, even though we have a such a great nutrition legacy (Mediterranean diet) and good, evidence based nutrition guidelines of our own, that health professionals here are not using them, but prefer the American guidelines. 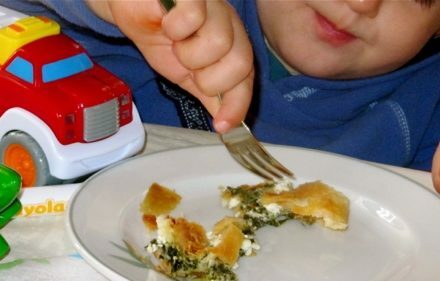 The Dietary Guidelines for Greek Adults were developed by the non-profit organization Prolepsis who was commissioned by the Ministry of Health. They are similar with the previous guidelines (1999) which were in the form of pyramid, also presented here. 1. 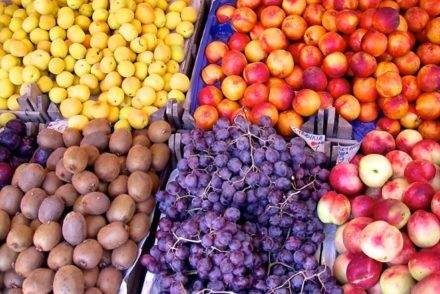 Consume a variety of fruit and vegetables everyday. 2. Consume a variety of grains everyday. Prefer whole grains. 3. Opt for low fat dairy. 4. Reduce the consumption of red meat. Choose lean cuts. Avoid processed meat. 5. Consume Seafood (fish and shellfish) often. Choose fatty fish and prefer small fish. 7. Choose olive oil as your first choice of fat. 8. Reduce consumption of sugar, salt and products that contain them. 9. Engage in physical activity everyday. Maintain a normal weight. *Table above has been developed and translated by Elena Paravantes. Unauthorized use of this table is prohibited. You are always so informative and also bring us such great recipes . I get excited when I see an email from you because I know it will be special. What a great compliment! Thank you Domna. Great read. Eating like a Greek should be the dietary guidelines! Thanks Karen! I think so too. Thank you I love your posts. I visit Cyprus a couple of times a year and I enjoy the food. I found it interesting that the Greek guidelines called for low-fat dairy, just like the US FDA guidelines … when we now know that whole milk is really more nutritious (and that eating fat doesn’t make us fat). I’m sure the Greeks following the traditional diet were drinking their goat milk whole, and their goat cheese was made from whole milk, too. Hi Steve, Yes I agree on that point. And yes you are correct traditional Greek cheeses are full fat. I just discovered your web site and it is great. I’ve been interested in Greek diet habits (and especially Ikarian eating habits) since I read a couple of the Blue Zone books. It looks like there is lots of interesting information on this site. 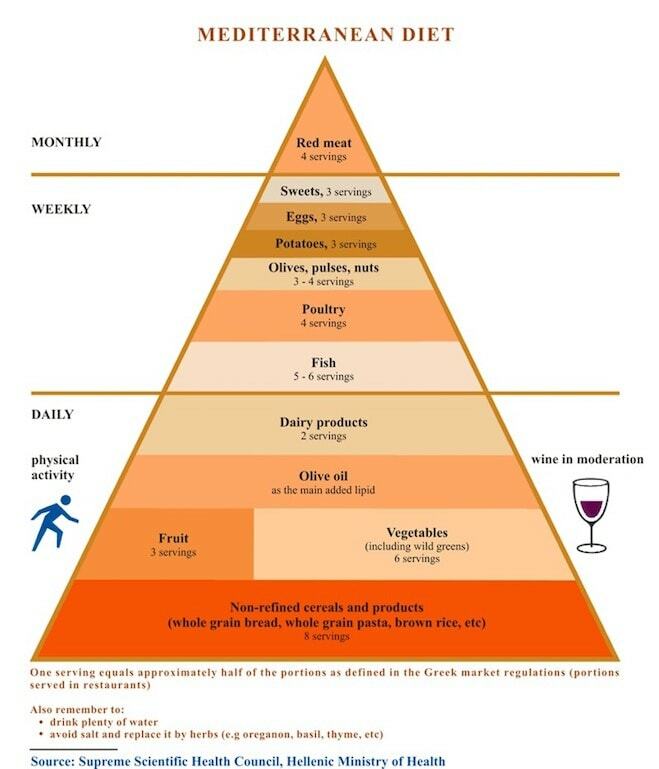 One thing I noticed from the Greek Diet Pyramid above, is that they also seem to want to follow the old US pyramid in emphasizing grains (by putting it at the base of the pyramid). If you look at the pyramid, they really should put fruits and vegetables at the base of the pyramid (9 servings compared to the 8 servings for grains). Yes that Greek Pyramid is from 1999, so the current guidelines are in table form (above) recommending 5-8 servings of grains a day. I love this article. I googled “Greek diet” today because I think the new US recommendations are BS. I lived in Spain for 2 years and know that this version of the med. diet is not truly Mediterranean at all! My doctor told me to start adding whole milk to my diet and more full-fat cheese so I can eat more like a Mediterranean person–ha! In Spain I possibly had 1/4 c milk per day and a small slice of cheese. In the US, dairy is about 1/2 of our diet it seems like and bread is the other half! Of course we want to support our farmers, but we need to shift not only the portions but also the focus of what we cook from meat/grain/veg as a side to delicious stews and salads that incorporate more veggies. If only we had a better understanding how to cook vegetables in this country to make them delicious to our children. Americans are so bad at cooking veggies–but we are getting better! Thanks for the recipes!!! Thanks for sharing your experiences Laura. Yes, making vegetables delicious is key to getting children to eat more of them. Yesterday I made the traditional greek cauliflower dish on your web site. It was delicious and I was amazed at how good something that simple could taste. I had it for lunch with some feta and sourdough bread. 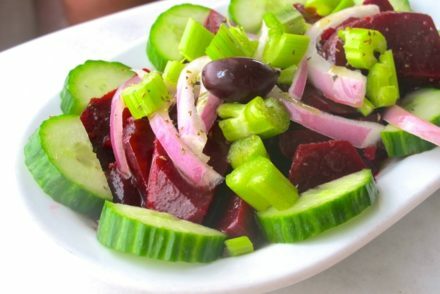 I know that these lathera are popular during fasting, but do Greeks eat something like this daily or several times a week? Wonderful. Yes these dishes are consumed all year round, I would say about 2-3 times a week. 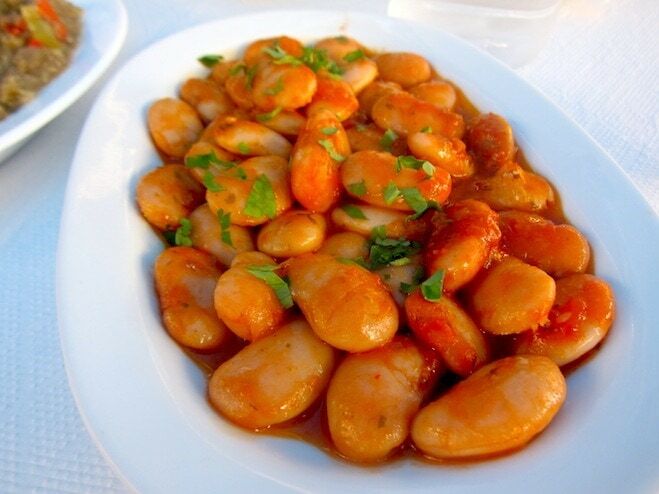 Although nowadays many younger Greeks eat much more meat based dishes than lathera. I hate to ask such a silly question but, what group are beans and lentils in? Grains? After suffering double breast cancer in 2014 l am focusing on my diet. The Greek diet seems to me the best and your table of the recommendations for an adult helps me lots. Can l ask a question, when l have been reading up about diet l came across the “Ikaria” diet. I was wondering if you could post about it on your blog and maybe suggest some recipes. If that is okay with you. Thank you so much Elena for this super-informative article – exactly what I’ve been looking for. I’m a bit confused though by the vegetable serving sizes…Today I made a scaled-down version of your (delicious!) fasolakia lathera, the beans, tomato and onion together (raw) weighed barely 300g but there was so much, I could barely finish it! Can a big plate like that really be only two of the four recommended daily servings? (Not to speak of 150g salad leaves!) Am I missing something?! Thanks Aimee! The recommendation is 4 cups of vegetables, so it depends on the serving, it looks like you would be getting more. I do mention in the fasolakia recipe that you can easily get 4 servings of vegetables in one meal. Yes, generally Greek Guidelines do not use cups, but I “translated” into cups as well. Thank you Elena, this is really great. I was just wondering, who are the guidelines for? Do you recommend to vary them by age or activity level (I am 28 year old girl, and I walk every day)? Hi Kristina, The guidelines are for adults with average activity.They do have specific recommendations for children as well. What would be a serving of softer cheeses like feta please? I think they are lower in calories than hard cheese? Also, do things like dates and dried figs and also avocado, count? I just stumbled across this page, amazing tips, recipes and insights! Thank you Elena! Yes, in the detailed guide they provide recommended values, these are based on the recommendations of EFSA (European Food Safety Authority) and the SCF (Scientific Committee on Food) which is the main committee providing the European Commission with scientific advice on food safety. For calorie level, they recommend 3 levels of intake based on activity and gender and instead of recommending calorie level, they recommend specific amounts of servings from each food group.